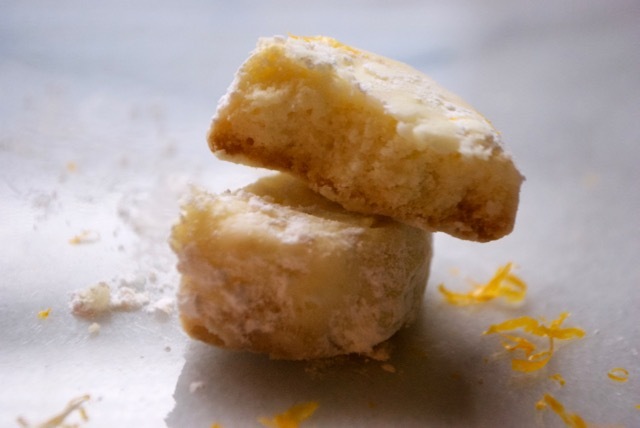 Lemon meltaways are a tender cookie made from a shortbread base. They’re coated in powdered sugar, crumble easily, and are designed, as the name suggests, to melt in your mouth. 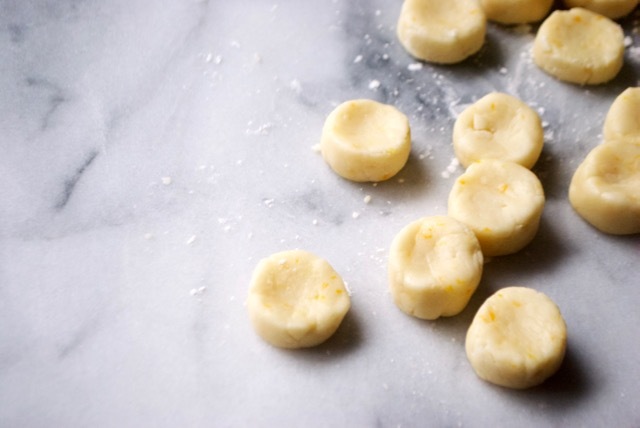 Lemon meltaways can be sweet or tart– this version stays on the sweet side, getting its lemon flavor from zest, and just a teaspoonful of juice. I based my recipe on this one from Stella Parks of Serious Eats. The Serious Eats version calls for tapioca starch instead of corn starch, for a more delicate, meltier cookie. I used corn starch, which is more of a pantry staple for me than tapioca. The cookies still tasted great to me, and I didn’t notice any missing melty qualities. However, if you do have tapioca starch on hand, I’d go with the Serious Eats recipe for something more tender. I made a few other changes to this recipe to make it a little simpler. Instead of blending the lemon zest into the dry ingredients in a food processor, I just added it directly to the dough. I found that the dough was pretty firm and cold when I was done mixing it, and it didn’t need an additional chill in the fridge before baking. I also scaled the recipe down by half, to make just 20 1-inch cookies. Feel free to double or triple it as needed. 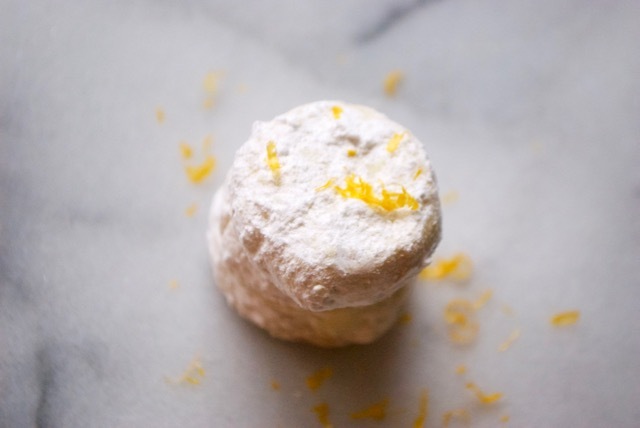 A light and lemony shortbread cookie coated in powdered sugar. Preheat the oven to 350 F. Line a baking sheet with parchment paper or silpat. Whisk together the flour, cornstarch, 2 tbsp powdered sugar, lemon zest, and salt in a medium-sized bowl. Cut the cold butter into the dry ingredients, and begin to knead it together. When the mixture begins to come together, but is still crumbly, add the lemon juice and continue to knead. The dough should turn into a smooth, cool, and not overly sticky, mixture. Turn the dough out onto a lightly floured surface. Shape it into a long, inch-wide log. Use a knife to slice the dough into 1/4-inch-tall rounds. If the cookies aren’t perfectly round, you can roll or pat them with your fingertips to smooth them into circles, dusting lightly with flour to prevent sticking. Place the cookies onto the parchment-lined baking sheet, spaced about 1 inch apart. Bake until the cookies are firm and golden-brown, about 12 minutes. When the cookies are out of the oven, cooled down, but still warm to the touch, spread them on a plate and dust them generously with the additional powdered sugar. Flip them over and dust the other side as well. Another way to do this is to place about a half cup of powdered sugar in a plastic bag, toss in 3-4 cookies at a time, and shake until coated, then remove the cookies to a plate to finish cooling. Note that this will create a less even finish than spreading the cookies on a plate and dusting the sugar over the top. Once the cookies are fully cooled, store them in an airtight container for up to a week. Adapted from Serious Eats’ Lemon Meltaway Recipe. Absolutely great flavor, taste and texture! I hope you love them, Karrie! 🙂 If you have a food processor the Serious Eats tapioca version is also mixed up in one and it makes it super easy.